I grew up in a small town in Alberta called Drayton Valley with my mom and 4 older sisters. Christmas was generally a very busy time of year as we spent it with my Mom’s brother (Uncle Rudy) and his wife (Auntie Dena) and their 3 kids as well as my nona (grandma). We alternated locations each year. One year everyone descended on our house and bedrooms were overflowing, couches transformed into beds and the house was filled with the smell of Christmas cake, polenta, chocolate chip cookies, spaghetti sauce, etc. And then the next year, we would pack up the car and travel to Sparwood, BC where we would all stay at my nona’s house and travel back and forth across the yard to my Aunt and Uncle’s. Here the food wasn’t that much different, except you could always count on a bowl of hot soup for lunch. As you can imagine, a house filled with 4 adults and 8 kids got pretty rambunctious at this time of year. We were in and out of the house all day long traipsing snow across my mother’s porch when we were told to come in for lunch. The sound of someone running up and down the stairs was almost a constant, like a drum beating. Laughter (or cackling) practically shook the windows as stories were told, Christmas movies were watched and the teasing commenced. As a child, my nona had a wood burning stove in her basement. And this is where she would bake her bread, her butterhorns and something so delicious that to do this day my mouth waters simply at the memory – cream puffs. Christmas, simply would not have been Christmas without them. Bring 1 cup of water to a boil in a medium sized sauce pot and then add butter and salt. Stir over heat until butter melts and then bring the mixture to a vigorous boil. Add the cup of flour and continue to stir until dough forms a soft ball and leaves the sides of the pan clean. Remove from heat and allow to cool for 5 minutes. Be careful not to overcook. Fold in eggs one at a time and stir them into the mixture briskly until the mixture thickens and becomes quite stiff. Repeat this process with the remaining 3 eggs. Using a spoon, place the mixture on an ungreased baking sheet. Bake at 450 degrees for 15 minutes, then reduce heat to 350 degrees and bake for 20-25 minutes or until golden brown. While the puffs cool on the counter, you can make the filling. Place the 2 cups of whipping cream into a medium sized bowl and using an egg beater, whip the cream until it begins to thicken. Add the sugar and the vanilla. You can also choose to add chocolate or raspberry jam or a combination of other tasty ingredients should you choose. 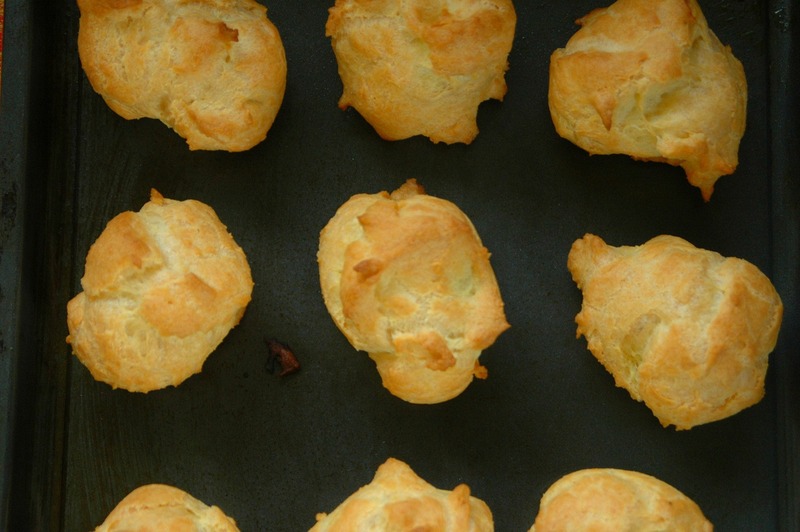 Slice the cooled cream puffs in half and spoon in your filling of choice.